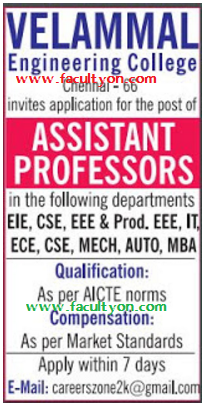 Velammal Engineering College, Chennai has advertised in the HINDU classified newspaper for the recruitment of Associate Professor jobs vacancies. Interested and eligible job aspirants are requested to apply within 07 days from 02nd October 2016. Check out further more details below. College Profile: The Velammal Educational Trust is a registered non-minority service organization established in the year 1986 by Thiru. M.V. Muthuramalingam to inculcate among the youth a sense of discipline which is important to mould them into useful and capable citizens. The watch words of the Trust are "Dedication, Determination and Distinction". Velammal Engineering College was established in the year 1995-96 to impart quality education. It is a self financing non-minority institution, affiliated to Anna University and approved by All India Council for Technical Education (AICTE) also ISO and Accreditation . How to Apply: Interested and eligible candidates are requested to send their detailed resume along with necessary copies of documents and passport size photograph to following email address within 07 days from 2nd October 2016.